Can I say I really love her books? I can imagine that this is going to be amazing. Nice! Been seeing this one around lately! Hope you enjoy it! I have Delirium but haven't read it yet. This book sounds so interesting!! Good pick! Oh, yeah. This one definitely's on the list! Love Lauren Oliver, love this blurb! I want to read this one so much. I've only read two of LO's books (Before I Fall, and Delirium), but this one sounds good, and I'm really curious to see how this one is. It's on Edelweiss, Christy - I think I'm going to request it soon. I'm definitely excited for this one, too. The game sounds intriguing and I love that simple cover. Great pick! I just added this to my Goodreads the other day. Sounds really good and I loved 'Delirium' so hopefully this doesn't disappoint! Great pick. All the cool kids are picking this one this week :) Happy you're spreading the word too! All the cool kids are picking this one this week :) Thanks for spreading the word! Hmm, I didn't like the Delirium series, but I am interested in this one. It sounds a lot like The Hunger Games though. But I did request it on Edelweiss. Wow, this looks awesome! I've loved both of the other Lauren Oliver books I've read so I'm psyched about this new one. Is it just me or does the summary sound vaguely Hunger Games-esque? Just added this book to my tbr list. I have never heard of this book or this author before but I will definitely be getting to know this author more. Thank you for stopping by and sharing and I hope you have a great week! This looks great. I didn't realize she had a new book coming out. Thanks for stopping by my WOW. I really like Lauren Oliver's writing, too. I was one of those people who actually liked Requiem, so I'm pretty excited to see what else she's got up her sleeve. :) Great pick! It seems like a lot of people are waiting for this one. I am definitely curious, but I may read her other books first. Thanks for stopping by my post! I was trying not to get all excited for this one and I keep seeing it on everybody's posts and now I'm all excited! I'm so excited for this one! Great Choice! I'm so excited for this one too (as you know because it was my pick!) :D I saw Lauren mention it was realistic fiction so I'm really excited to see how it compared with Before I Fall. Hope you get your hands on it! I love Lauren Oliver, can't wait to read this one! Thanks for stopping by on my blog, yours is really lovely. I'm sure Lauren's gonna impress again with this book <3 Great pick! Great choice! ;) Thanks for stopping by, Christy! 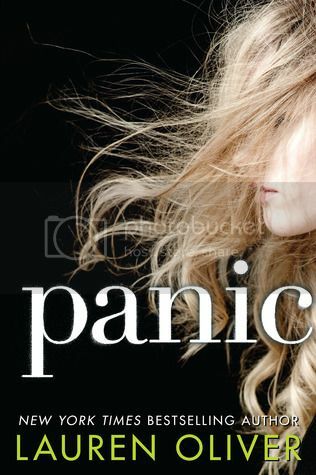 I'm dying to get my hands on Panic, too. I'll read anything by Lauren. Really looking forward to this, I loved Lauren Oliver's Delirium! And the cover is great, very striking. Great pick! Awesome pick, I love this cover so much! Can't wait for more Lauren Oliver, I just love her writing style. So excited for this! Before I Fall is still one of my favorite books and I'm thrilled for another release from this talented author.